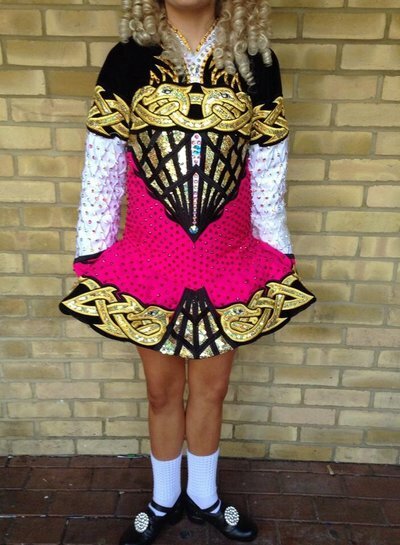 Standout Celtic Star dress worn by World Qualifier. Made in July 2013 and altered by Celtic star to meet shoulder strap requirements. No let down but 1.5 inches on both sides of zipper. Stoned by Celtic Star and hence very few stones are missing. Very Good condition. No snags or tears. Some embroidery on back at top of zip is pulled but not visible on stage. Black lining so no tan visible except for slight marking inside neck. Not at all visible on stage. Dancer is 5 foot 1 inch in photo. 1.5 inch let out on each side of the dress. No let down.